Through two reports and a documentary, the EJOLT team working on nuclear energy sheds light on the dangers of uranium mining in Namibia. Two NGOs in Namibia (Earthlife Namibia and LaRRI), a Brazilian university (FIOCRUZ), a French independent laboratory specialised in radiation (CRIIRAD) and team coordinator Marta Conde (UAB) partnered to produce this remarkable set of action oriented resources. After a public event on the 10th April 2014 in London – together with other activists from Madagascar, Papua New Guinea and the US who are also impacted by the activities of Rio Tinto – an article appeared in The Guardian. This event was organised prior to the Annual General Meeting (AGM) of Rio Tinto that took place on the 15th April 2014. In the AGM, Roger Moody from PARTIZANS presented the results of the study carried out by Earthlife and LaRRI on the impact of uranium mining on workers. While both reports are in the process of integration with other reports for a broader EJOLT publication on uranium mining – we decided to already share the insights EJOLT gathered on uranium mining in Namibia. 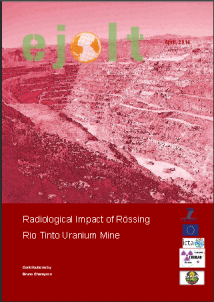 This report is based on radioactiviy measurements and soil, sediment and water samples taken in the vicinity of the Rössing Rio Tinto mine. It raises concerns regarding the management and contamination caused by the radioactive waste rock dumps and the tailings dam, where almost all the waste from mining the uranium is deposited. The waste rock dam is creating external irradiation and radon exhalation that is a risk to workers as well as tourists. Regarding water contamination, the team detected a significant increase of fluoride, nitrates and sulphates downstream of the mine. Uranium concentration increased by a factor of 2155, from 0.2 µg/l upstream to 431 µg/l downstream. WHO recommendation for uranium concentration limit in drinkable water is now 30 µg/l. Keeping any freshwater drinkable in a desert country like Namibia is a key issue – even if the drinkable water is not tapped yet. The tailings dam is further causing aerial dissemination of radionuclides, as wind gusts are carrying away radioactive particles. Also of concern is the risk of dam failure. That risk will be aggravated if plans of an additional 200million tonnes materialise. The team has detected that tailings of radioactive material have been used to build the parking area at Rössing. Rössing’s management considers these levels are of no concern. However the ICRP states that all radiation exposure should be maintained as low as reasonably possible. Moreover there are concerns that tailings could have been re-used in other areas of the mine. The study is based on 45 interviews with workers and ex-workers of Rössing. 39 of them have complained of health problems. Most workers stated they are not informed about their health conditions and generally don’t know whether they have been exposed to radiation or not. Some workers consult a private doctor to get a second opinion – that, however, is a measure that most workes cannot afford. Even though they receive courses on safety every year, some workers still confuse dust with radiation and believe wearing protective equipment protects them from radiation. In fact, protective equipment limits exposure (for example limiting dust inhalation) but does not protect workers from ionising radiation. Of main concern are those workers who started working in the mine in the 1970s and early 80s when safety conditions were non-existing or very poor. The interviews confirmed that many of these workers are by now retired and many have already died of cancer or unknown diseases. A previous study done by LaRRI in 2009 focused on the general working conditions whereas this study attempts to establish a connection between occupational exposure to low level radiation and toxicity and the health condition of workers. – Perform a large-scale epidemiology study with independent medical experts to examine those workers who started working in the 1970s or early 1980s. – The Ministry of Health and Social Services must get unrestricted access to all medical reports of all workers employed by Rössing. – Likewise all mine-workers should be able to have access to their own medical reports. – Rössing should allow independent specialists like CRIIRAD to have access to the mining facilities to carry out an independent monitoring of the mine. This could include detection of tailings re-use and checking the efficiency of the water pumping facilities of the tailings. – Rössing should provide CRIIRAD access to base-line monitoring data in order to confirm that the contamination of the river is caused by the mine. – An independent assessment of the stability of the tailings dam should be carried out. – CRIIRAD recommends that the tailings and waste rock dam are put undercover to avoid dust and radionuclides being carried away by the wind. In the Annual General Meeting of Rio Tinto, Roger Moody asked the CEO of Rio Tinto Sam Walsh, why mineworkers didn’t have access to their medical files, Sam Walsh stated that “All workers at Rössing are entitled to their medical records” and when enquired by Roger Moody on how to obtain them he replied “They only have to ask”. We look forward to it.